Cats can be finicky and it isn't unusual for one to suddenly decide they don't want to eat a certain food or treat anymore. But sometimes a cat stops eating for more serious reasons and you should be aware of the potential causes and concerns for this anorexia. There may be things you can do at home to help, but sometimes veterinary intervention is necessary. Why Is It a Problem if Your Cat Stops Eating? If a cat isn't feeling well, has eaten something that is stuck in its stomach or intestines, or simply doesn't like the food you are offering it, then it may stop eating. 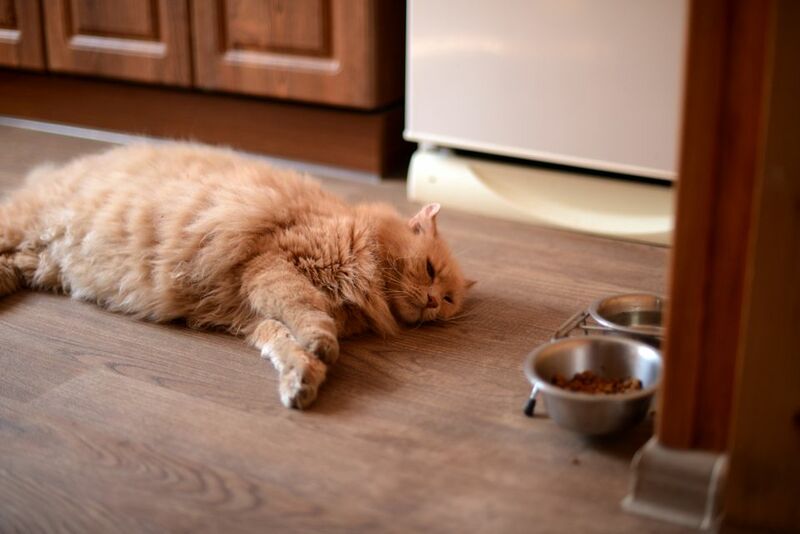 Multiple diseases and problems that cause pain or discomfort can be attributed to a lack of appetite in your cat but your cat not wanting to eat is merely a secondary symptom of those issues and not the main problem. Regardless of the reason though, if your cat stops eating, it is a major concern. Cats, especially obese ones, can easily develop something called hepatic lipidosis if they stop eating for a few days. This disease, often referred to as fatty liver disease or fatty liver syndrome, can be fatal if left untreated. This is the main reason why it is so important to make sure your cat doesn't stop eating. With fatty liver disease, the liver is overwhelmed trying to convert fat to energy and is then negatively affected by the fat that is subsequently stored around your cat's liver. The liver is a very important organ and if it is not working effectively, your cat will not survive without immediate treatment from your veterinarian. Respiratory problems can affect your cat's sense of smell or ability to breathe and therefore cause it to stop eating. Upper respiratory diseases may clog your cat's nose and eyes with discharge resulting in a temporary loss or restriction of sight and smell. Lower respiratory tract diseases may affect your cat's lungs causing it to have difficulty breathing. These respiratory issues may be able to be cleared up with some simple antibiotics or might be as complicated as cancer. But regardless of the severity of the respiratory issue, If the disease keeps your cat from being able to smell its food or makes it feel less than normal, it may decide it doesn't want to eat. Problems with your cat's stomach, intestines, pancreas, or other parts of its digestive system may cause it to stop eating. Your cat may also vomit, have diarrhea or abdominal pain alongside digestive issues, but usually a decrease in appetite will be one of the first signs of a digestive system problem. Acid reflux, tumors, an imbalance of intestinal bacteria, parasites, irritable bowel disease, and other problems can range from simple to serious in a cat. Some cats like to eat things that they shouldn't eat or develop hairballs and these items may get stuck in the cat's stomach or intestines. These items that aren't supposed to be inside a cat are then referred to as foreign bodies and if the foreign body is stuck, then it is referred to as an obstruction. An obstruction won't let food pass through the digestive tract and therefore a cat may vomit and most likely stop eating. Foreign bodies that don't get stuck may simply cause some vomiting and diarrhea and therefore also a lack of appetite. Diseased or painful teeth and gums can cause a cat to not want to eat. Cats can fracture teeth, develop resorptive lesions on their teeth and inflammation of their gums, get dental abscesses, and other dental issues that cause mouth pain. Just like people, a cat may not want to eat if its mouth hurts, but dental issues may be difficult to diagnose in a cat that has not been sedated or anesthetized. Cats can be particular. Some will eat one flavor of food for months or years and then suddenly decide they don't want to eat that flavor any longer. This is usually purely preference but sometimes food manufacturers change flavors without any obvious signs on the packaging. Cats can also be sensitive to certain shapes and textures when it comes to food. Some cats like triangle shapes, others like round shapes, and others will only eat hard or canned food. If you are trying to make your cat eat food that has expired or has spoiled, it may not want to eat it. Check the expiration date on the food or at the very least, give it a sniff to see if it smells rancid. If your cat has stopped eating its normal food, it is always a good idea to check to see if the food has been recalled. Sometimes cats can tell that something is wrong with their food and won't eat it if it's not normal. Depending on the reason why your cat has stopped eating, you may be able to do something to get it to start eating again. If an upper respiratory disease has caused your cat to be congested and unable to smell its food, you may be able to help clear its nasal passages by placing it in a steamy bathroom or putting saline drops in its nostrils. This will help break up the nasal discharge and hopefully help the cat to smell its food and breathe more easily. Food may need to be heated up or you may need to offer your cat an especially stinky food in order to entice it to eat. A few seconds in the microwave is all it takes to warm some canned cat food or tuna. Try feeding your cat a different flavor, texture, or shape of food. The food package should list at least some of this information. Check to see if the flavor of the food your cat has always eaten has recently changed and if so, try to find another food with the same flavor that it used to have. If you aren't sure about the flavor, try giving the pet food company a call. Get your cat checked out by a vet if it has stopped eating. This is the quickest way to find out if there is a medical reason—such as a foreign body obstruction or dental disease—for the anorexia and the best way to avoid bigger problems like hepatic lipidosis. Offer some kitten food, canned tuna or chicken, or appetite enhancing food to your cat. Give your cat Vitamin B12. There are over-the-counter, cat-specific oral forms as well as injections that your veterinarian may administer. B12 is known to increase the appetite of cats and is often depleted in cats with digestive issues. Since it is a water-soluble vitamin, it can't hurt to give your cat this type of supplement. Which Food Is Best for Preventing Urinary Problems in My Cat? Is Expired Cat and Dog Food Safe? How Often Should You Feed a Cat? How Much Water Does Your Cat Need to Drink? How Much Wet Food Does a Cat Need Every Day? What Should You Do When Your Cat Gets Fat?